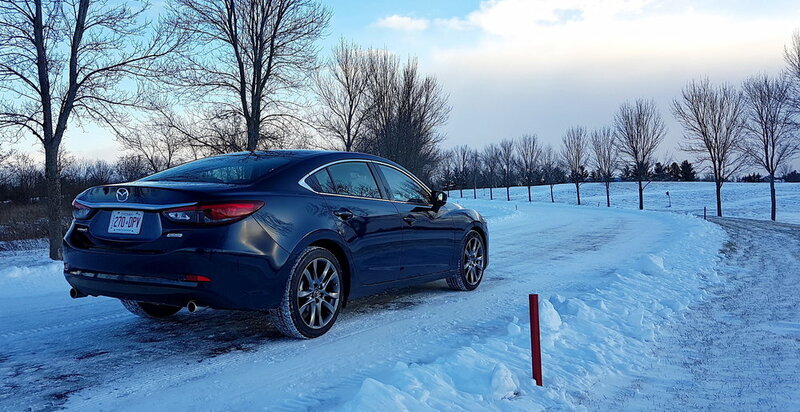 2017 Mazda6 GT - There's No Need to Fear, Underdog is Here! — Roving. Powerful words from one of the greatest automotive writers ever. The 626 continued to be the enthusiasts choice generation after generation, even before Mazda clarified its marketing message with the memorable “Zoom Zoom” campaign in 2000. In 1993, the 626, which shared its platform with the highly regarded Mazda MX-6 sports coupe and second-generation Ford Probe, was the sole entrant in the mid-size sedan category to offer V6 power with a 5-speed manual transmission. For an automaker, being the “enthusiast’s choice” is a double-edged sword because most car buyers don’t think of themselves as enthusiasts. The 626 was always just a hair smaller than the Accord and Camry, which is the kiss of death in the “bigger is better” North American market. Volkswagen struggled under the enthusiasts’ choice mantle for years with its Jetta and Passat, both darlings of the automotive press, until it began designing larger, North-America-specific models. As a former VW devotee, I weep for the personality those cars lost in their Americanization. Don't cry for Mazda though; they've done it right. The 626 became the Mazda6 in North America for the 2002 model year (known internally as GG1) as the company revised its naming convention. The car remained a bit smaller than rivals from Toyota and Honda as it was still designed for the global market, while the Camry and Accord were North America-only affairs. Mazda finally got the memo for the 2009 model year when it introduced an enlarged 6 designed for North America. The timing was unfortunate, as the 2008 financial crisis put the screws to the entire auto industry. In 2009, Honda sold about 8 Accords for each of the 34,866 Mazda6s to roll off the lot. Mazda has embraced its niche-player position and invested in design and development of machines aimed at enthusiasts, under the halo of the iconic MX-5 Miata roadster. The 6 that you see here bowed in 2014, an evolution of Mazda’s well-received KODO “Soul of Motion” design language. It doesn't just look good for a mainstream midsize sedan; it looks like it could have been the next Maserati Quattroporte. While Mazda has wisely chosen not to try to out-Accord the Accord, the 6 rides on an identical 111.4 inch wheelbase to the 2018 Accord, and is just .7” shorter in length. How long before this golf course kicks me out for trespassing on their access road? Mazda’s engineering philosophy is built around what they call SKYACTIV technology. It’s a holistic approach to automotive design focused on efficiency and lightness in the body, the drivetrain, and other systems. The heart of the system is the SKYACTIV-G 2.5 litre four cylinder engine. It produces 184 horsepower and 185 lb-ft of torque. It’s paired with Mazda’s SKYACTIV-Drive six-speed automatic transmission. The pairing is good for a 0-100 mk/h time of about 8 seconds. The 6, clearly, is definitely not going to be anyone’s weapon of choice for a street light drag race. To focus on the numbers when evaluating the 6 is a mistake. The SKYACTIV philosophy delivers an experience that transcends the spec sheet. While off-the-line performance is nothing to write home about, the 6 gathers speed quickly on the highway, owing to its efficient power delivery. There’s a tangible quality to this car that’s reflective of Mazda’s efforts to make the most of the engine’s output. It feels as though everything that moves has been given a liberal squirt of personal lubricant. The steering has a lovely, weighty quality to it, reminding you that you’re operating a driving machine, rather than aiming a transportation appliance. There’s very little torque steer, primarily because there’s not very much torque. GT models feature called G-Vectoring Control, which creates approximately eight pounds of engine braking pressure at the front wheels when cornering to improve stability and feel. It’s a testament to Mazda engineers’ willingness to question even the smallest details in their pursuit of driving nirvana. 2018 will bring a 227hp, 310 lb-ft turbocharged version of this engine, and it will be interesting to see how the front wheels of that car cope with all that twist. Over the road, the 6 has a surprisingly supple ride quality for a sporty sedan with 19” wheels. Perhaps there’s more Astroglide in the shocks, but the suspension telegraphs very little vibration into the cabin. Impacts are registered, but dispensed with very quickly. It’s athletic and engaging in the twisties, with very little body roll. It’s clear the 6 was made for this, and that it really loves its job. Inside, the 6 GT is kitted out like a proper luxury sports sedan. The dashboard is low and wide, with the infotainment touchscreen appearing to emerge from the top of the center stack. I’d prefer if it could be retracted like in the Audi A3, but at least it can be turned off easily to reduce distracting glare at night. The Black interior of my test car had topstitched leather accents on the dash and doors in a subtle chocolate brown that gave it a really upscale look and feel. The Pure White leather option, available by special order only, is absolutely chic-to-death. Because Mazda is competing in a mainstream category with the 6, they haven’t tried to reinvent the wheel by replacing all of the knobs and buttons with touchscreen functions. 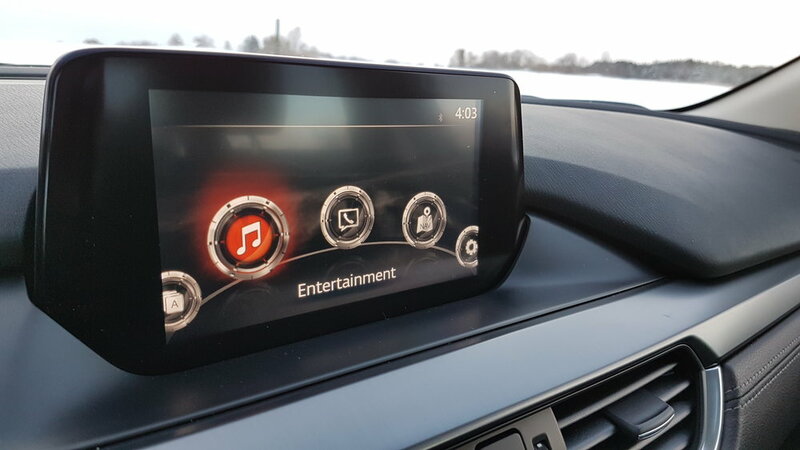 The redundant control wheel in the console does a good job of navigating the infotainment functions, and you have the option to use the touchscreen if you prefer. I’m probably starting to sound like a curmudgeon about touchscreens, but I just prefer buttons and knobs and that you get off my lawn. 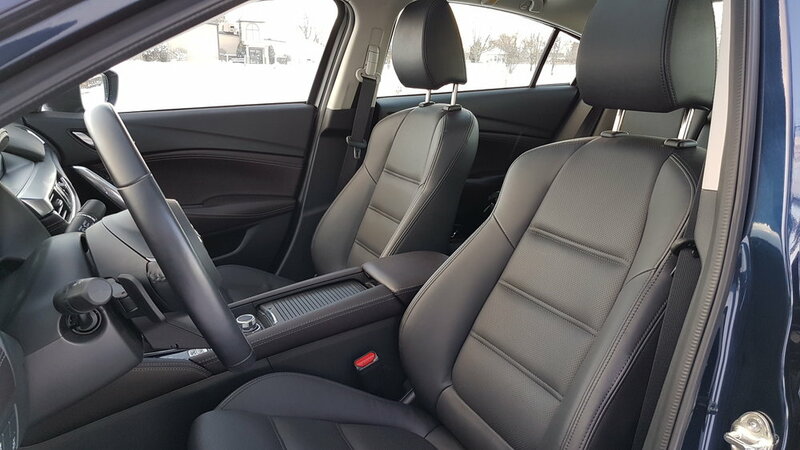 The seats are so well-executed that I remember noting that I liked them when I got in the car, and have literally no other recollection of them from my entire drive. They completely disappeared from my consciousness, which means they do their job perfectly. Both seats and the steering wheel are heated, which came in handy on the brisk -9°C day I photographed the car. Mazda's value proposition hasn't changed since this 1995 Millenia ad. Here’s another bit of history that might shed some light on what Mazda is doing with this car. In 1992, Mazda was planning to launch its own premium brand, called Amati. In addition to being an anagram for Miata, it means “Loved” in Italian. The line was to consist of three sedans and a coupe, but the plan was scrapped due to the recession. One of the planned models was sold from 1995 to 2002 in the North American market as the Mazda Millenia. Mazda currently has no plans to launch a second brand. Rather, they are moving upmarket in design, quality, and performance under the Mazda nameplate. I have no doubt that if Mazda succeeded in launching Amati, they’d be selling a car like this for $50,000 or more. My 6 GT, with standard leather seats, Bose sound system, blind spot monitoring, 19” gunmetal grey alloy wheels, and the optional automatic transmission (a 6-speed manual is standard!) cost just $32,895 CAD plus taxes and fees. A loaded 6 GT with the Premium Package ($1,500 for Nappa leather seats, contrast stitching, and satin chrome interior accents) and the Technology Package ($2,400 for Smart Brake Support, Mazda Radar Cruise Control, Lane Departure Warning System, Forward Obstruction Warning, High Beam Control System, Lane Keep Assist, Distance Recognition Support System, i-ELOOP regenerative braking, SiriusXM Satellite Radio, and Active Air Shutters) stickers for just $36,795 plus taxes and fees. This is the most underpriced midsize sedan you can buy. A true underdog. Special thanks to Budds Mazda of Oakville for providing my test car.